The Fitted Diaries: What's all the "buzz" about? If you've never feasted your eyes upon this beauty, which you probably haven't, this is the cap of Minor League Baseballs' Augusta Green Jackets. The Green Jackets, who are currently the Class A affiliate of Major Leagues San Francisco Giants, play in the South Atlantic League and have ever since 1980. Prior to being a Giants farm team they have been linked to the Pirates, Red Sox, Tigers, and Cardinals. Some Major Leaguers that you may know who have worn the cap shown are Kevin Youkilis (BOOOOO!!! ), Hanley Ramirez of Marlins fame, and The Kung Foo Panda himself Pablo Sandoval. The Green Jackets are owned by Cal Ripken Jr. who currently holds the Major Leagues Iron Man streak for consecutive games played. This cap I ordered online at the official website of the team which is linked at the bottom of the post. 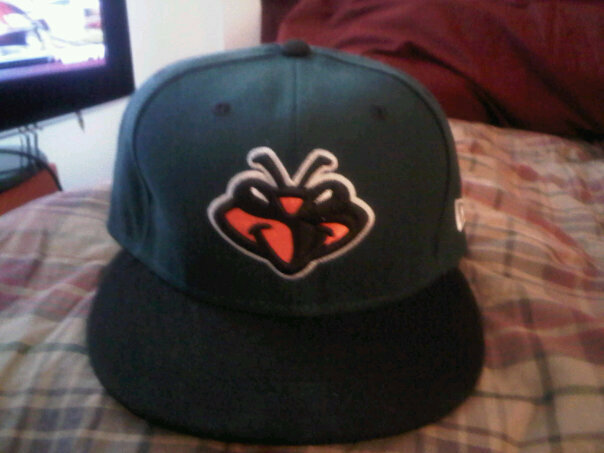 The fitted pictured has a forest green crown with a black brim, and a cartoon-like caricature of a bee head shaded orange and black. This is most definitely what people will be buzzing about when they break their necks staring at it. This cap can be found at: http://web.minorleaguebaseball.com/index.jsp?sid=t478 inside the link for the team store.